In a winter-friendly city such as Barrie, snowmobiling is more than just an occasional recreational activity for many. Home to hundreds of kilometers of winter trails ideal for snowmobiling, Barrie attracts both local winter sport aficionados and tourists from around Ontario. Like any high-speed motor vehicle activity, however, snowmobiling has its risks. Factor in the inevitable hazardous weather conditions that are oh-so-familiar in any northern Ontario town, and the risk of personal injury from a snowmobiling accident begins to climb. Over a thousand Canadians are hospitalized annually for snowmobile accident related injuries, and nearly one hundred of those accidents prove fatal. These numbers have ranked snowmobiling as the second highest cause of sports related deaths in the country. A Barrie man was involved in a fatal crash when his snowmobile hit rocky terrain, throwing him from the vehicle. A 53-year-old Barrie resident was airlifted to the hospital with non-life-threatening injuries after his snowmobile hit a pressure crack on a frozen lake. A former Barrie Colts player lost his life when his snowmobile collided with an SUV. Considering the volume of those injured in snowmobiling accidents, it is unsettling how few are actually informed of their legal rights in seeking personal injury compensation. Many insurance companies skirt the subject, when in fact, snowmobile accidents are similar to other motor vehicle collisions. Just as in a car accident, injuries sustained from a snowmobiling accident can cause lasting physical and psychological harm that can affect one’s ability to earn income or continue self-care. Anyone injured in a snowmobiling accident in Barrie should consult a personal injury lawyer to determine if they are eligible for financial compensation. Persons injured in a snowmobiling accident in Ontario have two avenues for pursuing monetary compensation: from their personal insurance company, and from the person who caused the accident. Unfortunately, the process to apply for insurance payouts can be complicated, frustrating, and time-consuming. It is not uncommon for insurance companies to deny benefits that they are actually obligated to pay, and a plethora of rules and regulations governing when, how, and to whom a claim may be registered can render a case invalid by technical default without the injured person ever understanding why. Like a car crash, the lasting effects of an accident often extend to victims’ family members as well, particularly when such cases result in long-term disability or loss of life. 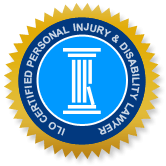 The skilled lawyers at Injury Lawyers of Ontario (ILO) are your best option to ensure that all relevant and unique aspects of your situation are argued on your claim. By having an ILO lawyer on your side, you, as the injured party, are relieved of the stress of processing a claim, and can receive the best possible compensation for your injuries or loss. We will analyze your situation, inform you of your rights, and determine a fair value for your case. Our vast experience with insurance claims ensures that our clients are not disadvantaged by insurance companies who are attempting to pay out the least amount possible for a claim. Your Barrie ILO law team also offers free initial consultation and personalized service. We at ILO urge anyone who has suffered a personal injury, be it from a snowmobiling collision or another accident, to contact Personal Injury Lawyers in Barrie for more information. This can be done by visiting one of our offices, contacting us by phone, or using our confidential online form. No injured person should be denied access to legal representation. If you are physically unable to visit one of our offices in person, inform us, and we will send a legal representative to you to begin your claims process.